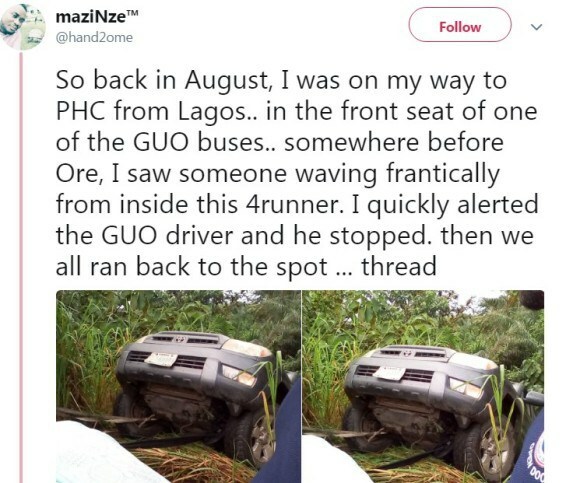 A Twitter user with the handle @hand2ome shared his heroic experience when he was traveling from Lagos to Portharcout City. He recounted his ordeals and how he helped save the lives of the occupants (family) in the Toyota 4Runner SUV. The man behind the wheel lost control and was at the verge of falling inside a big ditch with his family in the SUV; then the good Samaritan intervened. It happened in Ondo State. So back in August, I was on my way to PHC from Lagos.. in the front seat of one of the GUO buses.. somewhere before Ore, I saw someone waving frantically from inside this 4runner. I quickly alerted the GUO driver and he stopped. then we all ran back to the spot…apparently, this 4runner skidded off the road and was supposed somersault backwards into a very deep ditch by the roadside.. I still can’t explain what kept it hanging/dangling. it was like a touch of the finger will just topple it into the big hole behind it. The driver, probably a young man in his mid 30s just kept his foot on the break. he is a hero. I probably would have been so scared looking out the window to see the valley behind me and my foot will tremble uncontrollably. but he held fast and waved frantically. when the dangote truck began pulling, it was like the 4 runner was goring to rollover as it wasn’t a straight pull. remember there wasn’t enough space to pull straight. but God in his infinite mercies.. the jeep was out and it’s occupants safe. oh God was I relieved? One thing that struck me was how I forgot that I had a phone during the whole rescue activity. I was all dirty from handling big ropes and going under the truck to tie them. I was so involved that I didn’t even remember that there is something called pictures. it was when we got back in the bus that someone now mentioned pictures. eventually I collected these two pictures via whatsapp from one of my co-travelers. I really felt very useful. remember to drive safe guys. remember to help anyway you can when you can. Big shout out to the GUO driver “sorry I can’t recall his name” who stopped instantly and took part in the rescue process as well. also was really impressed by the Dangote trailer driver, we hear a lot of bad reports but hey.. good reports abound too. blessed.